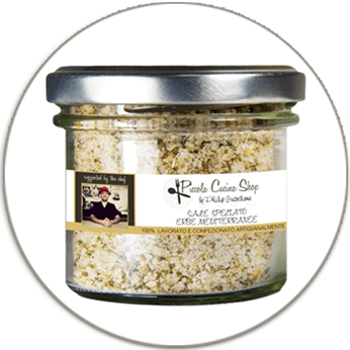 A combination of finely chopped sicilian herbs combined with a fine sea salt for an excellent aroma mixture. The ideal mix for everyday use in the kitchen that adds to your dishes a hint of typical Mediterranean scents . The intense perfume of the mediterranean Herb Salt adds a pinch of sicilian summer to tomato salad, fish, grilled meats, stews, soups and pizza. Spices up fresh cheese and yoghurt.